Scientists have known for a long while that birds are distant descendants of dinosaurs. There’s a good chance that studying the physiology of birds can help us understand the physiology of the long-extinct T. Rex and other massive prehistoric animals. Researchers at the Universidad de Chile decided that a chicken could be just the bird to help them do that. The researchers were interested in studying how the Tyrannosaurus Rex might have walked. Chickens might have a walk somewhat similar to the mighty dino, but the chicken’s inherently different body shape means that modifications had to be made. The researchers raised chickens that had prosthetic tails (which, by the way, look like tiny adorable plungers) attached from birth, mimicking the dino’s physiology. The chickens grew up with the tails so never learned to walk like regular chickens. Instead, the added weight caused them to counterbalance by adopting a slightly different walking style. 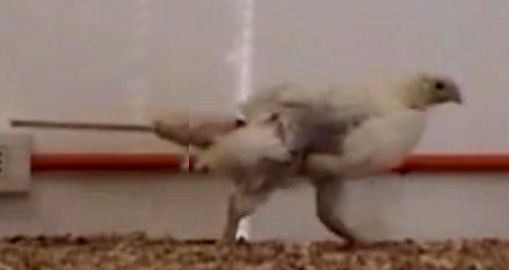 The dino-tail-wearing chickens adopted a walk that begins at their hips rather than at their knees, like other chickens. The researchers’ video shows what dinosaurs may have looked like while trudging around their hunting grounds…but we have to imagine that the giant reptiles would have looked a lot more menacing and a lot less cute than this strutting chicken.